Johnny Rockets franchise opportunity: Are you considering it? You should be aware that data released by the Small Business Administration (SBA) indicates that Johnny Rockets franchise owners who qualified for SBA-backed franchise loans have a very high loan failure rate of 56%. Are you familiar with the this franchise opportunity? If so, please share your experience, opinions or insights with a comment below. If you are a company franchise representative or employee, please leave a comment or email us at UnhappyFranchisee[at]gmail.com. Johnny Rockets franchise owners have a 56% SBA loan default rate. It’s likely that these franchise owners who received SBA loans may have collateralized their franchise loan with their homes or other personal assets, and many were unable to repay those franchise loans… despite the serious incentive to do so. What do you think of the Johnny Rockets franchise? Are you familiar with the Johnny Rockets franchise opportunity? What do you think accounts for the high SBA loan failure rate of their franchise owners? What steps should the company be taking to stop further franchise failures? Has Johnny Rockets Licensing Corporation taken serious action to address the problems that led to these loan failures? ARE YOU FAMILIAR WITH THE JOHNNY ROCKETS FRANCHISE OPPORTUNITY? 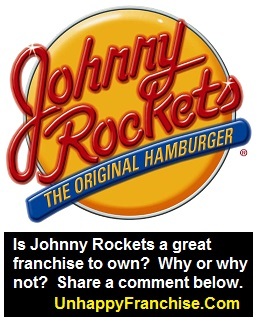 ARE YOU A CURRENT OR FORMER JOHNNY ROCKETS FRANCHISE OWNER? PLEASE SHARE A COMMENT BELOW. Today sept 15 2012 I went 6 flags discovery kingdom and we stopped and ate at Johnny rockets. It’s was my first time eating at you’re restaurant. I was very upset with the quality of the food there. The hamburger was under cooked and cold and the fried and onion ring was cold. One of my friends found hair in her food, another requested no souse and got souse, another as for is hamburger well done and it was not cook well done. When requested to talk to a manager I was told that there was no manerger on site but one could be called, but did not know if one be in or when they will show up today at all. Due to this experience I truly want to return back to you’re restaurant but I am afraid that I will get the same food service that I gotten today. I have been very sick with a colon infection and Johnny rockets refuses to let me go back to work .I have asked them why?The company said that they were checking their records and said that I have two complaints filed against me.The company refuses to show me my record. Does that mean that the company can make false accusations without proof . I have no other choice but to seek legal counsel and the Labor Board. I went to Johnny Rockets May 2, 2013. My visit today was horrible. For starters not only did my waiter not state his name, he did not even have on hiss identification badge. I ordered the #12.This burger was supposed to have the “ketchup with a kick” on it and it didnt; so i called the waiter over to get my order fixed, and he goes over to his manager ,comes back to my table and says, “She won’t let me make another one because she says she knows she put everything on it.” From then, everything went downhill. When i asked to take the burger off my ticket he had an attitude towards me and my mother and was extremely disrespectful to me as a customer, paying my money . I will never ever go back to Johnny rockets again in my life. I have informed everyone I know about the service i received. Johnny Rockets has lost a customer . my daugter and myself have eaten at jonny rockets in kissimmee.on john young parkway in the past. just so happens Im also a licensed plumbing contractor. my company took a service call to repair a leeking 2 inch water main 20 foot up in a hole in the ceiling. 1 man on top 1 man saftying the bottom. after the fix the manager refuses to pay the entire bill and procedes to tell employees what he”s going to pay. simple math;;;; if johnny ordered 1 hamburger how many burgers would johnnypay for? if johnny ordered 2 burgers how many burgers would johnny pay for? I also noticed the kitchen was a little cluttered and could use some cleaning.